Mores Creek Summit Backcountry Skiing: The Knob (Pilot Peak) - Little new snow, a new rain crust layer, and Good Skiing! The Knob (Pilot Peak) - Little new snow, a new rain crust layer, and Good Skiing! As we drove past Idaho City this morning it was raining. We became somewhat concerned. As we gained elevation rain continued. It finally transitioned into snow past the Freeman switchback (Mores Creek drainage), just 100 feet from Mores Creek Summit. It was somewhat disappointing to realize that the Thursday and Friday night storms forecasted snow amounts, storm totaling 20 cms of snow precipitation, did not materialize. Above 7000 feet and at locations minimally impacted by the moderate winds, there were as much as 3 cms of new snow. In other more windward locations, the sheer glare of the rain crust was very visible. At all elevations and aspects, under a thin layer of Friday morning snow, a thin rain crust layer was present. At elevations below 6500 feet, the crust became started to impact the quality skiing. 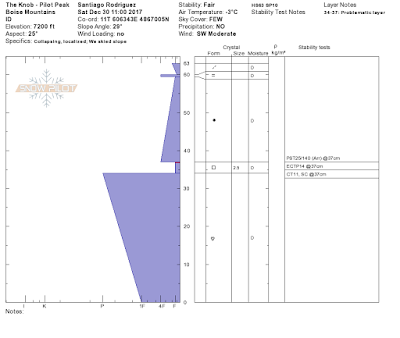 During the last two visits, the snowpits were located 10 meters below ridge tops. Today's snowpit was located 100 meters from the top. The structure was similar and the only remarkable difference was that the weak layer was only 3 cm thick, quite thinner from the 9-10 cms thickens at below the ridge tops at Summit Creek Glades and Almost Top of the World. Stability test results are similar to the December 25 and December 27 stability tests. The next video shows the compression, extended column, and cross-propagation saw, and regular propagation saw tests. KnobDec30_2017 from Santiago Rodriguez on Vimeo. In the video, you will notice that we continue to play with the experimental horizontal PST, also called "cross" PST or CPST. Today stability test results continue to be consistent with the stability tests conducted during December 25 and 27th. In addition, the PST for the three days (December 25, 27, 30) arrest the fracture propagation after the slab fractures. I am uncertain of why this was observed again today. The warm temps and rain have greatly increased the strength of the slab. 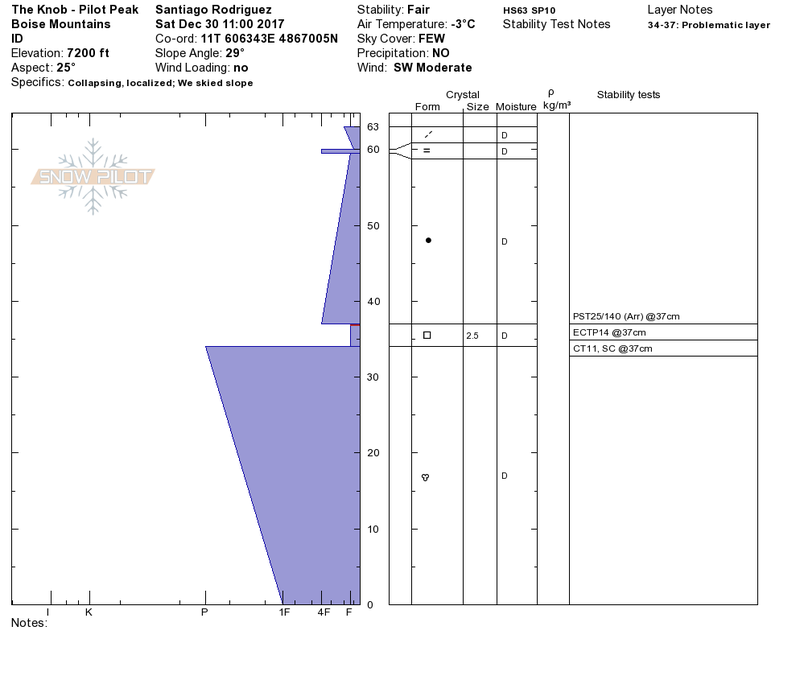 Reviewing the pit picture of snowpit reveals that the slab hardness goes from Fist at the top to 4-F at its bottom. I did not observe surface cracks today, but ominous whumpfs were still frequent. These whumpfs are consistent with the stability test results. Based on this test results we avoided slopes above 35 degrees and used an inclinometer to verify slope angles. The skiing was surprisingly fun. When skiing, as we lost elevation elevations the crust transitioned into a thicker crust. This crust, depending on aspect, had the potential of increasing the instructional level of skiing. But we selected ski lines with NNE aspects as well as protection from the wind. We suspect that the protection from the wind minimized the amount of liquid water reaching the snow surface from a light rain event last night. The sky partially cleared late in the morning and we were rewarded by wonderful views of the Boise, Sawtooths, and Trinity Mountains. Check the next sequence of photos. Can you recognize Copper Mountain at Banner Summit? Friends continue to ask me about coverage. If you use Pilot Peak road, you can skin to above 7000 feet to reach the Upper Summit Creek Glades, The knob, Almost Top of the World, and Top of the World. The coverage of the North and East aspects is adequate. You just need NOT get carried away and drop into the Summit Creek drainage below 6400 feet. Check the next two pictures. The top picture was snapped from the Knob, looking north into "Top of The World", and the second picture is looking south into the upper Summit Glades. These pictures should give you an idea of the coverage above the 7000 feet level. Yes ... it is not ideal the shallow snowpack we are skiing at MCS. We are 50% off from the average depth for this time of year. Yes, we need to be conservative with the fracture propagation propensity of the snowpack. Persistent slabs are unpredictable. Yes, we need to carefully select ski lines to avoid deadfall that can hurt us. Use existing Forest Service roads to get to higher elevations and avoid skiing shallow areas below 6500 feet, where your skis can get snagged. But it is not a bad idea to go out and train your body for the skinning required by the powder days coming soon. Besides, it is a great idea for those that have taken avalanche courses to practice stability tests and experience first-hand how an unstable snowpack behaves during testing.